There are also strategies using NASDAQ index fund ETFs like PowerShares QQQ during pre-market trading hours or as after hours stock daytrading. 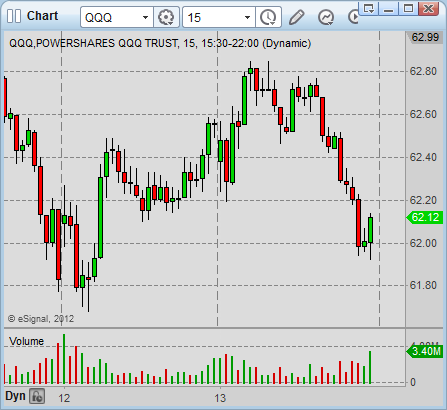 The range of the QQQ index ETF daytrading systems is rather wide. Systems that trade the QQQ could use some momentum models, news intra-day strategies and also technical trading based on real time streaming stock charts that analyze price action or use some technical intra-day trading indicators for the decisions. The selection of individual strategy for QQQ day trading is then based on time-frame that is used for realization of short-term trades with QQQ index fund. Short term QQQ index trading strategies based on this very short time-frame for single candlestick are often scalping strategies. Daytraders use an actual price action and bid/ask evaluation of current supply demand for their decision. The level 2 stock quotes are used in this trading style. No additional technical analysis indicator is used. The trading period is typically one or two hours after the stock market open when the volatility of the market is highest. This type of daytrading strategy requires high level of attention and sometimes is the preferred strategy for automated stock trading systems. This is a typical time-frame period for discretionary day traders that use price action for their decisions. The usage of additional daytrading indicators rise for traders using 10 or 15 minutes time-frame period for QQQ day trading. The trading period for daytraders using a 5 to 15 minutes time-frame is typically the first two hours after the stock market opens and the last two hours before the stock market closes. The two charts below show different periods during a trading day for these time-frames. Trading in 10 or 15 minute time-frames allows the use of price action methods, but also chart patterns or candlestick chart patterns ideas on the charts. This time frame provides a broad situation overview. The daytrading systems that use this type of strategy often expect that the trade can last more than one single day. So the short-term traders trading PowerShares QQQ using this time-frame should expect to hold overnight risk of price movement. Day trading strategies using 60-minute streaming stock charts are based on price action, chart patterns or on using some daytrading indicators. Many daytraders love to use short-term moving averages for their decision. Here I would like to note two tips that will improve your QQQ day trading strategy. 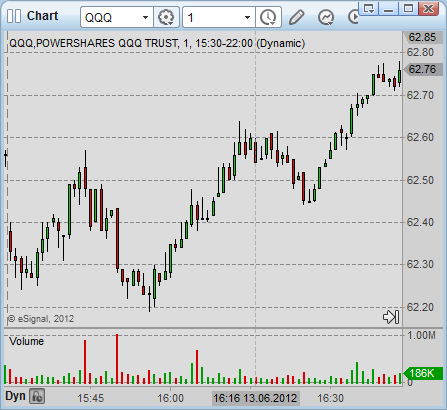 Choose your basic time frame for your PowerShares QQQnday trading system. But you also have to use a larger time frame to check the broad situation with the NASDAQ 100 index and its ETF QQQ. You have to analyze the broader NASDAQ 100 index fund situation to know the preferred trading direction for traders and investors that use larger time frames. The second tip is to use some form of leader concept. 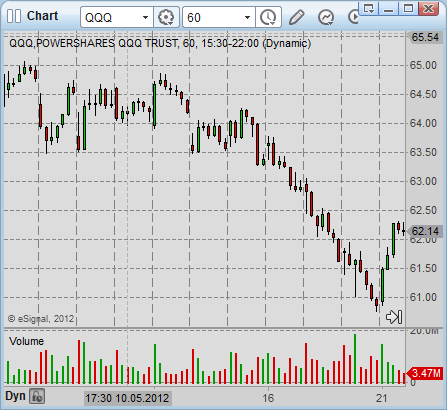 There are times during a year when daytrading QQQ index ETF shares is influenced by some leading stocks or sector. There were Internet stocks during the NASDAQ bubble that acted as leading indicators for intraday traders. 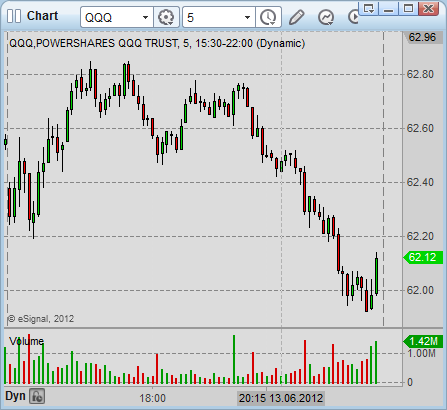 It was AAPL stock that affected movements of PowerShares QQQ in the 2010 – 2012 period.